Do you need to get insurance for a trampoline? Having a solid understanding of trampolines and homeowners insurance will help you to make an informed decision before moving forward, so let's jump right in. Do You Need Insurance for a Trampoline? Is There a Homeowners Insurance That Allows Trampolines? What if I Don't Tell My Homeowner's Insurance Company About My Trampoline? Why Don't Insurance Companies Like Trampolines? Will Owning a Trampoline Make Insurance Go Up? Trampoline Fence Law: Do You Need a Fence To Have a Trampoline? Can a Tenant Have a Trampoline? What if I'm a Landlord and My Tenant Owns a Trampoline? Most states have a government website and you'll want to check yours to see if there are any specific laws in place that require you to have trampoline homeowners insurance. If your city doesn't have a website to look this information up, you should be able to call City Hall to find out if there are any local ordinances requiring you to carry insurance for your trampoline. Even if there are no state or local requirements, your insurance company may require you to have some sort of coverage for your trampoline. 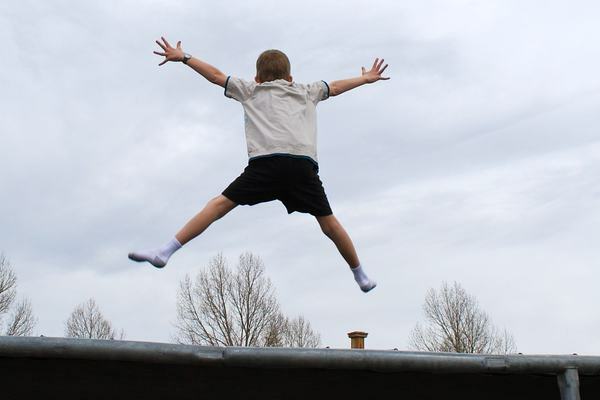 There are insurance companies that offer coverage for trampolines, but not all do. This will vary from state to state and even from company to company. If you're not sure if your company offers coverage for your trampoline, contact your insurance agent for more information. No Exclusions: Basically, this means your insurance company does not have any specific requirements for your trampoline. If a visitor or a member of your household is injured while using your trampoline, some or all of the related medical expenses may be covered by your policy. If your trampoline suffers some sort of damage, this may also be covered. Coverage with Safety Precautions: This may require you to have certain safety devices installed, such as a net and approved padding in order to receive coverage. As long as your trampoline meets all state and local safety requirements, you should be covered. You'll want to check with your insurance company to see if they have any additional safety requirements that need to be met. Trampoline Exclusion: This means that your homeowner's insurance does not allow coverage for trampolines. It may also mean that your insurance company will not allow you to renew your homeowner's insurance policy if you put a trampoline on your property. It is strongly suggested that you check with your insurance company to see if they have a trampoline exclusion clause and, if they do, be prepared to switch to a company that allows trampolines before you place one on your property. Certain homeowner's insurance policies may offer liability insurance for trampolines. It's a good idea to check your policy or ask your insurance agent if this is the case. If not, you'll want to secure some form of liability insurance to cover potential accidents or injuries that may occur when a member of your family or even a visitor uses your trampoline. This is important because health insurance doesn't always offer the coverage you may need when treating trampoline-related injuries. Trampoline injuries can be potentially severe and, depending on the coverage level of the health insurance policy in question, you or the injured party could end up paying lots of money out of pocket without supplemental liability coverage in place. Having a good liability policy for your trampoline can also help to offer legal protection in the event that an injured person chooses to pursue legal action against you should an accident occur. Don't overlook this important detail. A little research in this area could save you from a lot of potential problems down the road. You may have to switch insurance companies: Some insurance companies simply refuse to offer coverage if you own a trampoline. Some may even refuse to allow you to renew your policy if you place a trampoline on the covered property. Your insurance premiums will likely increase: Trampolines come with a lot of potential liability. Even if you have taken every precaution and have the best safety measures in place, insurance companies know that the likelihood of an injury occurring on your property is going to go up if you own a trampoline. Landlords are legally responsible if a trampoline is on a rental property: Because of this, many insurance companies are not comfortable with offering coverage for trampolines on a rental property, even if they do offer it for homeowners. This is because, even though the tenant owns the trampoline, the landlord and, by extension, their insurance company, will be held responsible for paying any damages to the property and medical expenses in the event of an injury or accident. While it may seem easier to just "forget" to tell your insurance company that you have a trampoline on your property, this may not be the best course of action. Despite the challenges associated with making sure you have adequate insurance coverage for your trampoline, neglecting to tell your insurance company is generally a bad idea. Loss or damage to your trampoline will come out of your own pocket: If your insurance company doesn't know about your trampoline, should anything happen to it, you'll be responsible for repairing or replacing it without assistance. Insurance companies will not cover a loss on property items they were not aware of before a claim is filed. You may be exposing yourself to legal action: Without proper homeowner's and/or liability insurance in place for your trampoline, should a visitor experience an injury while using your trampoline, they may choose to sue you for damages and medical expenses. If you don't have a policy to protect you, paying their expenses could end up being the least of your concerns. Your insurance company may cancel your policy: Whether your insurance company has a trampoline exclusion policy in place or not, if they find out you have a trampoline on the property they have the option to cancel your policy immediately. Even if your insurance company does have an exclusion policy, they will likely not cancel right away when you tell them about your trampoline but rather, will simply not allow you to renew when the policy expires. This will at least give you some much needed time to find a policy that will cover your trampoline. Your insurance company may be able to take legal action against you: While simply canceling your policy is more likely, your insurance company may have grounds to sue you for falsifying information. Winning legal battles is what insurance companies do. This is not something you want to have happen. The easiest way to answer this is to ask, "why don't over-protective parents like trampolines?" The same reason applies to insurance companies: trampolines come with an inherent risk of injury. Insurance companies know this and must be prepared to cover this additional cost on their end. They also know that houses with a trampoline on the property have a higher chance of filing an injury claim than houses that don't. It should come as no surprise that adding coverage to an existing policy or securing an additional policy to cover your trampoline is going to come at a cost. It may be necessary to weight the cost of this additional coverage when deciding whether or not you really want to place a trampoline on your property. We strongly recommend that you do not skip out on getting this additional coverage, as the benefits far outweigh the cost. Yes. Typically, you can expect the premiums on your homeowner's policy to go up by $50 to $100 a month. This may vary though, depending on the state you live in and your insurance company. We suggest obtaining a minimum of three quotes from different companies to see where you might be able to get the best coverage for your money. While this is not always the case, in most places you will be required to have some sort of fence or enclosure in place as long as there is a trampoline in your yard. This requirement may be imposed by state law, local city ordinances, or even a clause in your insurance policy. Even if there are no regulations requiring you to have a fence around your trampoline, it is still strongly recommended to prevent uninvited visitors from entering your property and using the trampoline without your permission. Whether they have your permission or not, if somebody is injured on your trampoline, you will be held responsible. Asking visitors to sign a trampoline waiver, or waiver for jumping on a trampoline has become popular in recent years. 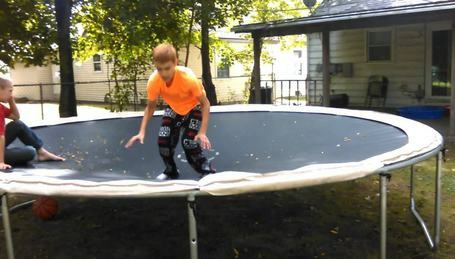 Specific guidelines can be determined by you, but the most common clause in these agreements states that the visitor (or their legal guardian) understands and accepts the risks associated with using your trampoline and agrees that they will not hold you legally or financially responsible in the event of an accident or injury. 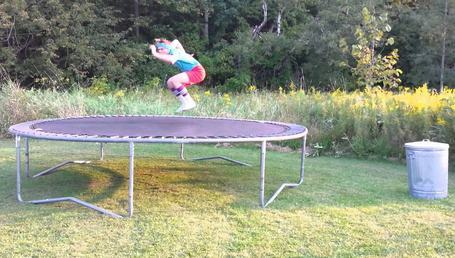 Having a trampoline on a rental property can bring its own set of unique challenges. The most important thing to keep in mind, in this case, is that it's best for both parties involved to agree that a trampoline should be allowed on the property. Tenants should never place a trampoline on a rental property without first seeking permission from their landlord. If you are a renter and you have or plan to get a trampoline, proceed very carefully. It can be quite difficult, if not impossible, to find renter's insurance that allows you to have a trampoline. Even if you are able to find a policy that will offer coverage in this area, your landlord will most likely be very against this idea. Always check with your landlord first before placing a trampoline on a rental property. They are, after all, the owners of the property and that means they have a lot of responsibility for the safety of anyone that enters the property. If your landlord does not want you to have a trampoline on the property for any reason, it's best to honor their request. As much fun as they can be, it's not worth risking an eviction or possible legal action. ​Specific requirements and regulations imposed by the property owner's insurance company. Whether or not the property owner feels comfortable with accepting liability. Speak to them first: It may be possible that the tenants simply were not aware of the situation having a trampoline on a rental property can place you in as the owner. You might be surprised how quickly and easily a situation can be resolved by having a friendly, honest conversation with them about the issue and kindly asking them to remove the trampoline. Demand that the trampoline is removed: If your tenant simply isn't willing to listen when you speak to them, you do have rights as the owner of the property. Even if your lease or rental agreement doesn't specifically state that renters can't have a trampoline, it likely also does not specifically say that they can. Ultimately, it's their responsibility to check with you before doing anything that you may be liable for. Send them a certified letter, with return receipt requested, informing them that they have ten days to remove the trampoline. If they fail to comply, eviction is an option. Evict the tenant: As a property owner, nobody likes having to do this. But if all other attempts to resolve the situation have failed, it may be in your best interest to have the tenants removed from the property. Add a clause to future rental agreements: Take this as a learning experience. If your lease or rental agreement does not have a clause specifically stating that trampolines are not allowed on the property, take the time to add one to all future contracts. This will make dealing with similar situations much easier in the future. There is quite a bit for you to consider in terms of securing adequate insurance coverage for a trampoline on your property. Hopefully, this information has at least set you on the right track. The best thing you can do if you still have questions is to ask them. Check with your state government, City Hall, your insurance company, and even other trampoline owners if you need more advice on how best to proceed.